Ahhhh, another lovely horrible day in New England. There's nothing quite like waking up, shoveling, going to work, coming home, shoveling, and finally getting to eat dinner around 8 pm. Problem is, I'm in no mood for cooking ...so I'm having ice cream for dinner, woo hoo! 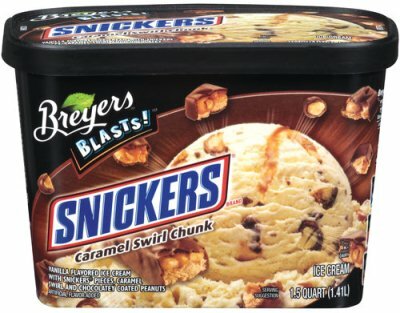 I haven't had any Breyers on the blog in awhile, so a few shopping trips ago I picked up their official take on Snickers Ice Cream. I've had the awesome Snickers Ice Cream Brownie, and nothing beats a Snickers Ice Cream Bar, but it's time to taste test some mass produced Snickers Ice Cream. So here it is, Snickers Caramel Swirl Chunk Ice Cream : Vanilla Ice Cream with SNICKERS Chunks (cough)yeah right(cough), Caramel Swirl, and Coated Peanuts. I just noticed something. Descriptions always say chocolate coated peanuts or chocolaty coated peanuts, this just says coated peanuts. Maybe they ran out of room to write on the container. I'm very hungry so I can't wait to dig in. Snickers really satisfies and my growling belly needs filling. The first few bites actually make me think of Crunch 'n Munch. I take a few more bites as I examine my prey. There are several thin caramel swirls to be seen, and all of the big brown spots you see are coated peanuts. Unfortunately, those tiny brown spots you see are my beloved Snickers "Chunks" which have been blended into oblivion. 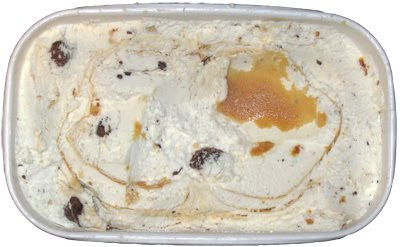 I like the way that tiny bits of Snickers add an overall mild snickers flavor to the base vanilla ice cream. However, I would appreciate it if they would go back when the mixing was done and actually add in some real Snickers chunks like they promised me on the label. Yes I understand that frozen Snickers chunks are quite hard, and probably a mild dental work hazard, but a promise is a promise. I want Snickers! The caramel swirl is just fine. It's a fairly mild flavor by itself. I didn't really get an overly salty or artificial flavor from it. Ice Cream Texture is also good and way better than that funky stuff I found in Edy's MAXX. This flavor may have chunkless shortcomings, but at least it's made like a real ice cream. At the moment I'm going to rate this one as decent, but not as good as I wanted it to be. Sometimes extreme hunger clouds my judgement a little, so I'll head into the second scoop expecting a serving that has more mild flavor than I had hoped for. Plus, I'll still be digging for Snicker Chunks, though I know I probably won't find any. On Second Scoop: I went to reach for some tasty morning waffles and decided to have a few bites of Snickers instead. Problem is, I still don't really think it tastes like snickers. The base does have a mild snickers flavor, but at least if you get some of the swirl, you're easily transported to caramel land. There's not even a snickers after taste. Oh well, it's not bad, it's just not really Snickers. 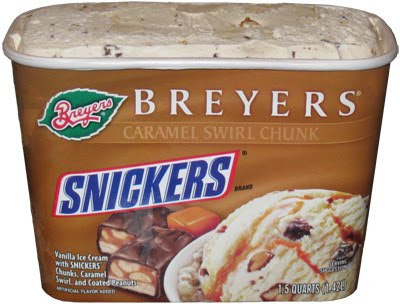 Update: This flavor still lives on as Breyer's Blasts Snickers Caramel Swirl Chunk. By the way, I've never seen that Snicker's Ice Cream Brownie bar but I want one RIGHT NOW!!! Yeah, it doesn't seem like too long ago that I noticed companies writing chocolaty instead of chocolate. Now we have stepped even lower with chocolate flavor instead of chocolaty. COATED PEANUTS: CHOCOLATE FLAVORED COATING (SUGAR, COCONUT OIL, MILK, LACTOSE, CHOCOLATE, COCOA POWDER, SOY LECITHIN, VANILLIN), ROASTED PEANUTS (PEANUTS, SALT).